Sarafina offers many original and unique products, made in house, for use in perfecting your needle felting sculptures or making the process more efficient. Over the years we have used them in our video tutorials as they developed; therefore, not every tutorial makes use of our current product line and more products may arise! If we had Swax when filming the mouse, for example, Sara would not have used beeswax on those tiny toes. The following will inform you about the possible uses of each product allowing you to choose the correct one for your project. Keep exploring the many uses of these materials to see how they work for you! Beeswax: The original beeswax, which Sara used early on in her tutorials, is for fingers and toes on animals and people. You dip the wire into the wax and it helps the fiber stick. We offer it in clear (white) and black. Beeswax is not for use on top of wool as it will dry brittle and flake. 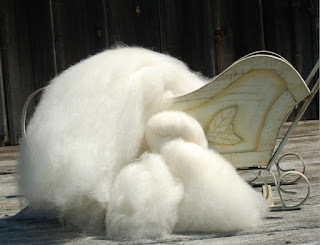 If you are interested in a product that can be used both under and on top of the fiber you will want to consider Swax. 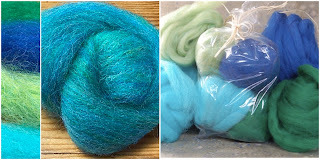 Ewe Smooth: Ewe Smooth was our first development to help tame fibers. It can be rubbed onto your hands as you work with fiber and does not need to be melted. We considered stopping the Ewe Smooth production once we had Swax and Tacky Wrap, but people said "No! Keep it!" So we did :) Felters like having it to rub onto their hands when working with wool, especially in the winter when hands are dry. A fun discovery was that it is good to have some on your hands when working with Swax. It helps the stickiness of Swax stay off of your fingers and it is easier to press Swax into fiber to create a smooth and shiny finish. Bunny Butter: We are tossing this in here because it is another product that we make in house (in Talbot's Waxology Lab). Bunny (and Gnome) Butters are intended to be a hand lotion. It really does a nice job with dry hands. It can also be used when working with Swax to keep the Swax off of your hands and smooth onto the project. Paverpol/Fabric Hardener: We offer the fabric hardener for anything that you want to completely stiffen on a project. This is great for application on things like a horse hoof, beak, talon, or horn. After experimenting with Paverpol and Swax, we have found that your fiber will do much better accepting the fabric hardener when it is well felted. It essentially solidifies any texture or imperfection. You can add Swax to the top of the Paverpol. For a smoother finish, we would suggest only using Swax. It is best to experiment with these applications on a piece separate from your finished sculpture first so you know what to expect. You can apply Paverpol with a paintbrush and it will wash out. Do not let it harden on the paintbrush though! Tacky Wrap: Tacky Wrap can be rubbed onto your wire before wrapping. There is no melting needed. It keeps the wires nice and sticky so you can get a small amount of fiber wrapped onto the wire and it will stay put. It will stay sticky so you do not want to use it on top of wool. Tacky Wrap is offered as a "Sticky Bun" or as pre-dipped Tacky Wrap Sticks. The sticks are thoroughly coated and convenient to use. The Sticky Bun can be rubbed onto any wire and even allows you to omit the pipe cleaner on aluminum wires if you really want a skinny wrap but need aluminum wire (like on the Doe project). 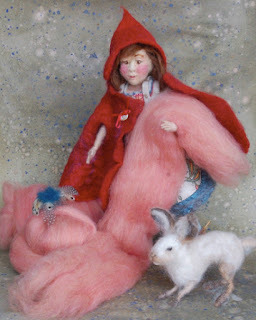 Tacky Wrap is one of Sara's favorite creations and we are so pleased to offer it to needle felters. Sara shows its use in detail on the Tacky Wrap Tutorial. Swax: Another favorite at Sarafina is Swax. This must be melted to use. Once melted the wire can be dipped into the Swax, then you can press fiber into it and it will dry but stay somewhat malleable. Swax will not stay sticky and dries smooth to the touch. Swax can also be colored with powdered pigment, so if you are making something like a gorilla and want a "shiny" face or chest you can use black powdered pigment in Swax. Swax can also be buffed a bit when it dries, which creates a nice "shine." Swax is best applied with a rubber tipped applicator like the Colour Shaper chisel set. You do not want to use a paintbrush to apply Swax. You can see Swax in action on the Swax Applications Tutorial. In the Sarafina Art House we like to have fun with fibers to come up with our house carded blends. 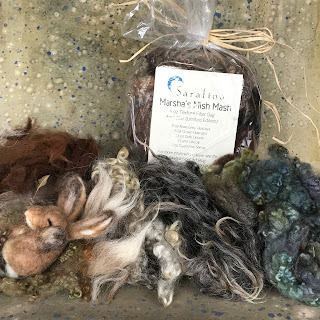 Sara continually creates special blends with fibers for her own use which then work their way over to items that are available to you through our SarafinaFiberArt Website. On Friday, March 9, 2018 Sara went live through the Sarafina Fiber Art Facebook page with this video to explain a bit about color blending and makes three kinds of wool batts. 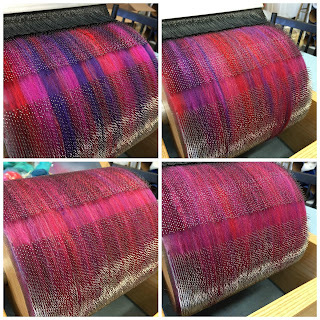 At the Sarafina Art House, we receive a lot of phone calls and emails asking us for specific colors for very specific projects, and we often suggest picking up a few different fibers and blending them to get the result you want. 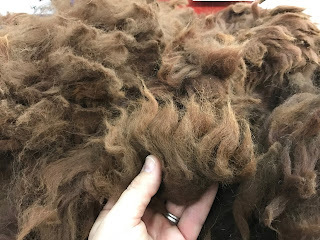 In the Carding Fiber: Color and Texture Video, Sara discusses which fibers she picks to make a core wool blend, top coat blend, and a fur line blend. A great place to get you started on your color blending adventure would be with our line of Top Coat Roving Samplers. 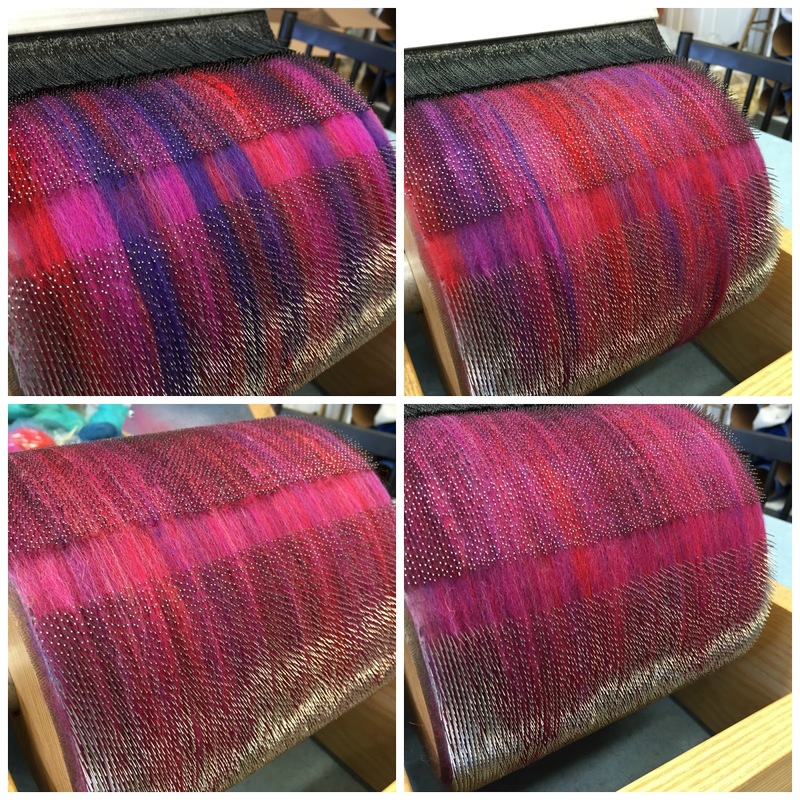 To achieve similar results to what our photo shows, grab a Sarafina™ Roving Sampler Pack and pull equal amounts of each color. 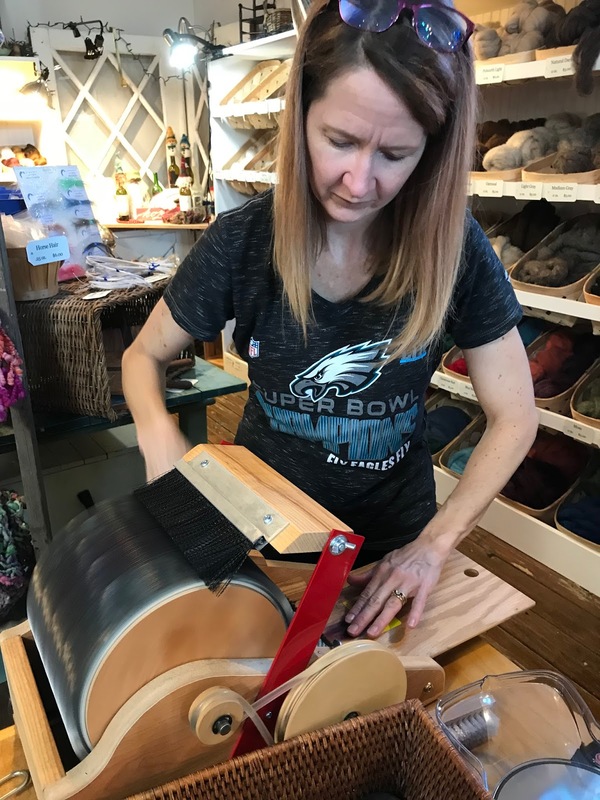 We like to use our Strauch Drum Carders to blend colors because we work in larger batches, but if you have a pair of hand carders, you can get the blending job done. These samples below were passed through the small drum carder 3 times. 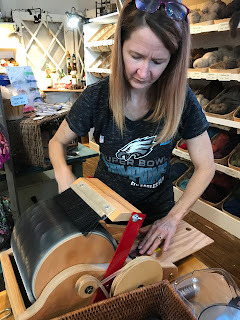 The process of blending fibers on a drum carder is pretty simple, but you must pay attention so you do not get hurt as there are moving sharp parts. 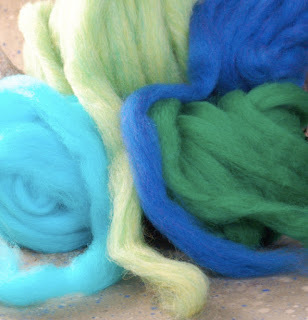 Check out the Sarafina™ Carding Fiber Video. First you pull the colors you want to blend. Align some of the fibers so they will feed into the carder. Gently place your hand on the fibers as they feed in giving them a little resistance so they are not sucked in all at once. Please watch your fingers as the blades are SHARP! Continue to add more fibers until the larger drum is full. 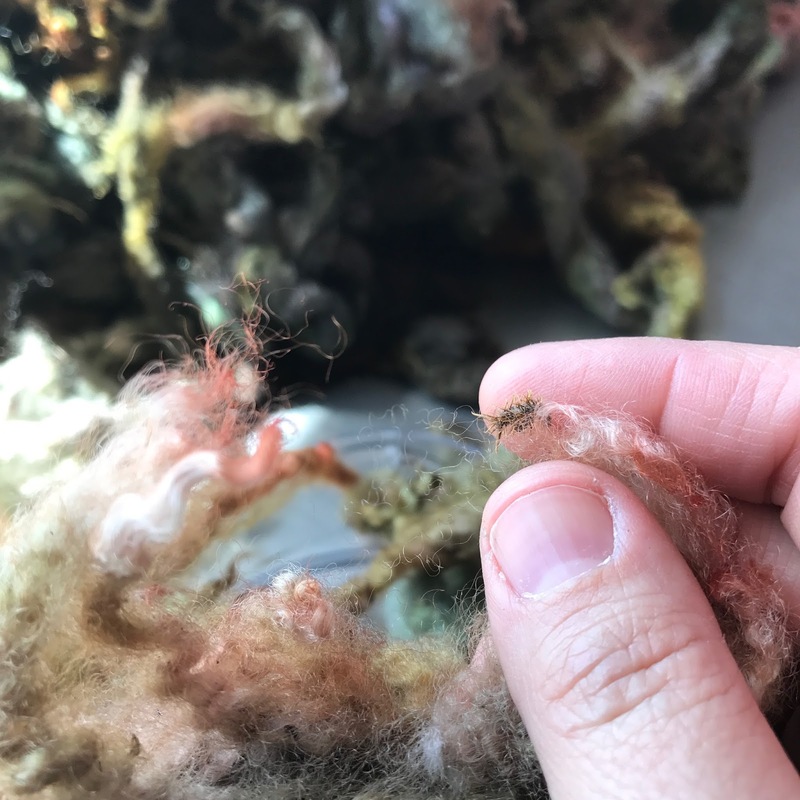 Remove the fibers from the carder, pull the fibers apart into smaller sections, then run them through the carder again a little at a time. Repeat this process until your fibers are blended as much as you want (we usually blend 3 to 4 times through). 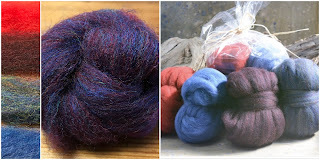 Sarafina™ Berries Blended on the Drum Carder - 4 times through. Here is a link to watch Sara show how to blend fibers using the Sarafina™ 8" hand carders. Marsha's Notes: On my day off a couple of summers ago, I came into Sarafina with my tub full of top coat roving. 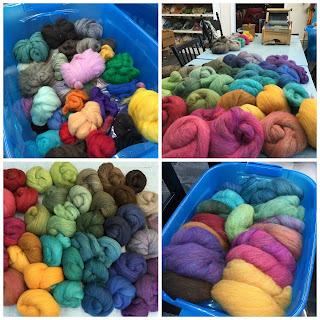 I was on a mission to blend up a lot of new colors to use in my needle felting projects. I used the Strauch manual carder in the shop to blend all of these, just varying the amounts of certain colors to achieve new blends. It was just like mixing paint colors, but with wool. I would recommend taking photo notes of colors you use for blends as you work so you know how to repeat it if you love something. And if you don't love it, you can always break it up and blend it with other colors to see what else you can make. Grab all of the Sarafina™ top coat colors and really have some fun blending colors! 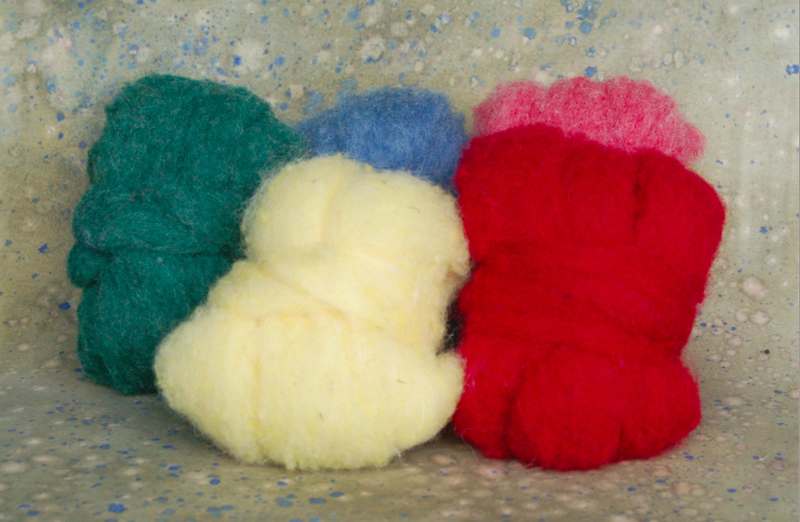 I was also working on some wet felting vessels and wanted to combine merino fibers to make new colors. I did not need large amounts of these blended, so I opted for using my 8" Sarafina™ Hand Carders which made an easy job of creating nice floaty colors. But we will save those color blends for future blog posts. 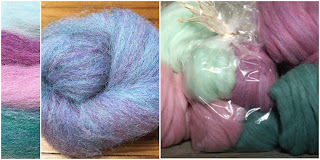 Sarafina™ Merino Roving (21 micron Merino) Random Hand Carder Blending. Please be adventuresome and combine various top coats, merinos and other rovings we carry and share your results through social media with us. to show us your color blends! We may show off some of your images through future blog posts! 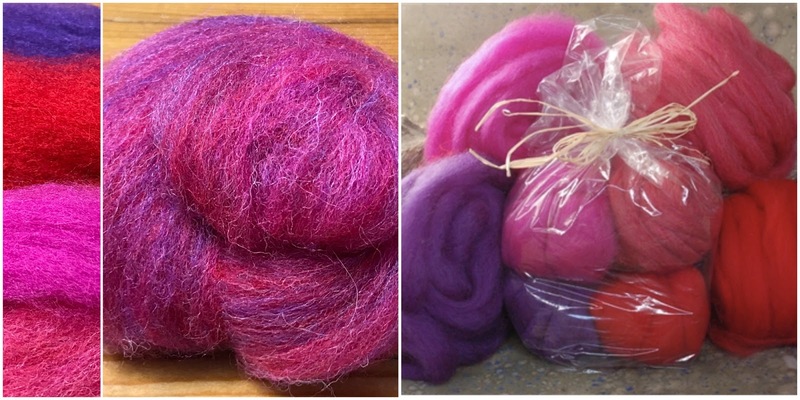 Join the Sarafina Felting Fanfare group over on Facebook to show off your projects using Sarafina™ products, get help with projects, and join in our community of fiber enthusiasts. 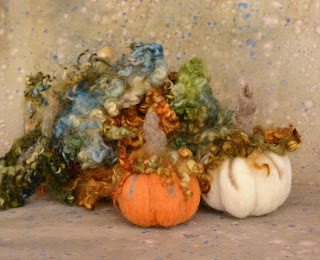 Want to make some needle felted pumpkins? 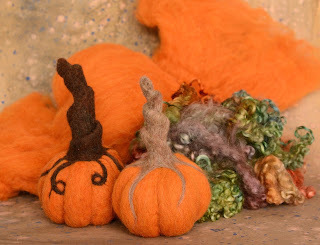 Needle felted pumpkins are a great beginner project and we have a couple of video tutorials on how to make pumpkins. We have recently added some fun House Carded Pumpkin Batts and coordinating Dyed Sheep Curls to our website for your pumpkin felting pleasure. 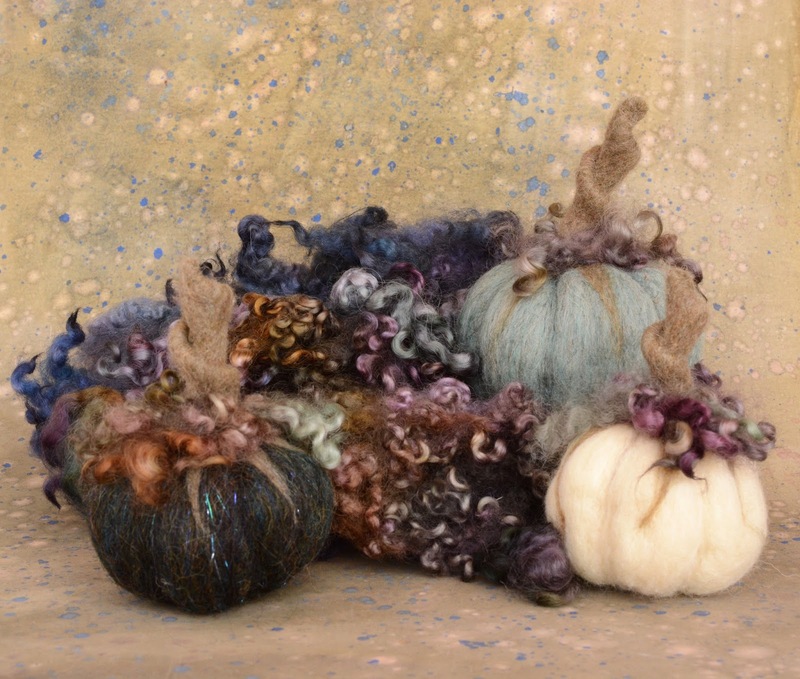 This blog post is meant to help guide you to finding the right Sarafina™ wool products to make beautiful pumpkins. If you are just starting out, try starting with our Sarafina™ Pumpkin Tutorial Video and Pumpkin Supply Pack. In addition to the supply pack, you will need a needle felting surface like our Stabbit (that you fill with 3 pounds of uncooked rice) and needle felting needles. Pen Tool, Punch Tool, Sarafina™ Zullitool. Toothpicks, bamboo skewers, pencils are always good to have on hand for wool wrapping. See our Tools and Hardware page to shop for lots of fun tools. 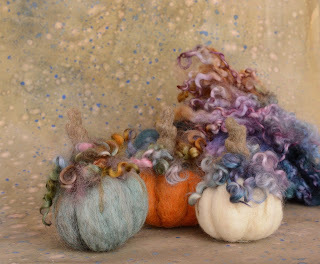 Once you feel comfortable with making the basic pumpkin shape, and you want to expand your pumpkin palette, watch the Needle Felted Pumpkin Bonus Material Video and look at these next photos will help you pick out some of our coordinating batts, locks and core wool to be more successful with your project. Remember that the Vine Pumpkin Patch Batt makes a great pumpkin stem color! 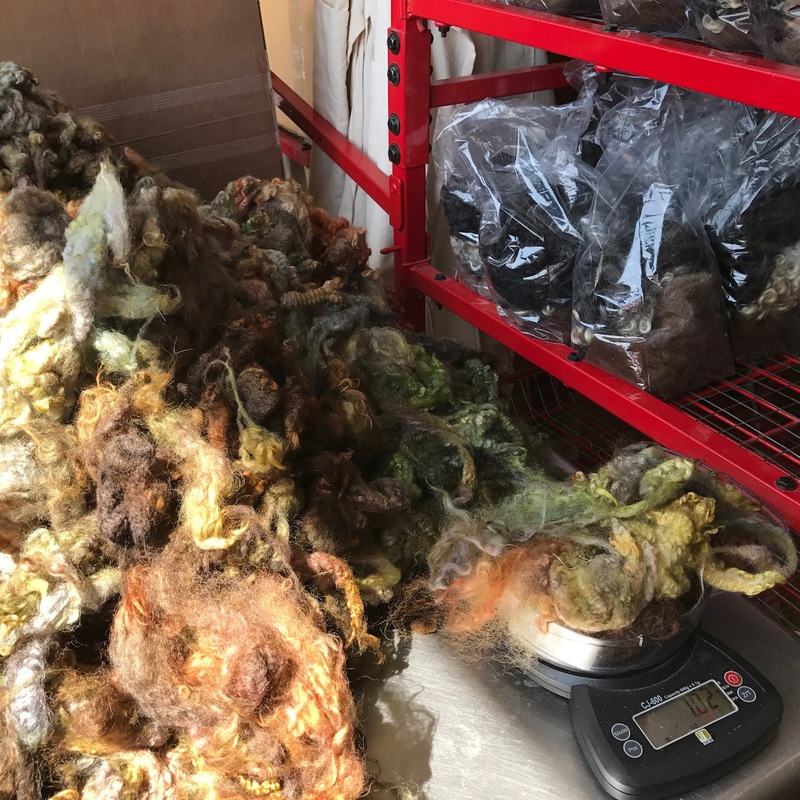 Please keep in mind that the hand dyed sheep curls that you receive may vary slightly from the photos due to the nature of sheep fleeces being from individual animals, and dye variations in the dye pot, but they will in these palettes. 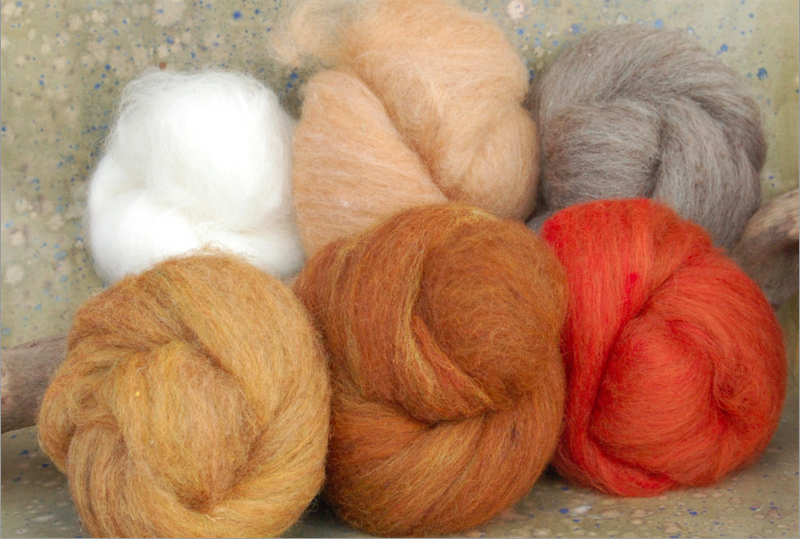 Next are suggested core wools that coordinate with the Sarafina™ Pumpkin Patch Batts. You can buy most of these core wools in Sampler Packs to try them out. 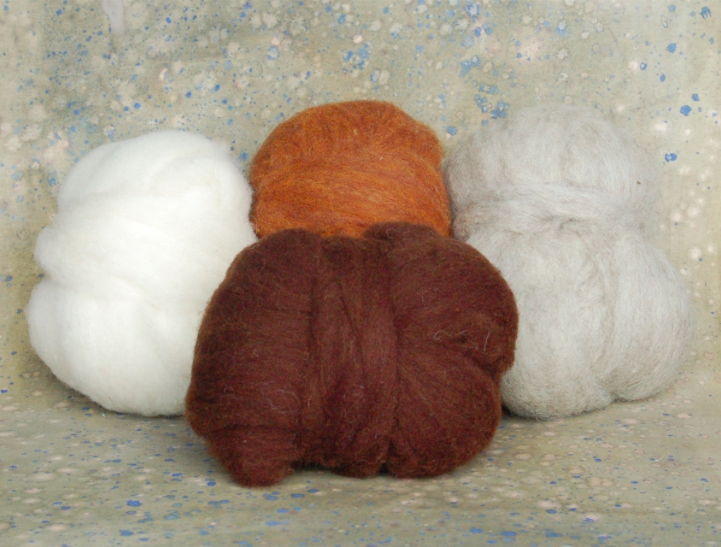 If you want the most for your money, consider buying the individual 2oz or 4oz balls of core wool. For the most uniform color and fast success, try to match a core wool with a batt or top coat color that will cover it. 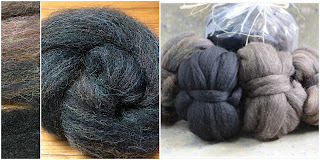 If you want a challenge, try a core wool underneath that is darker or lighter for a different tone, knowing you will probably use more top coat or batt to cover the core wool. 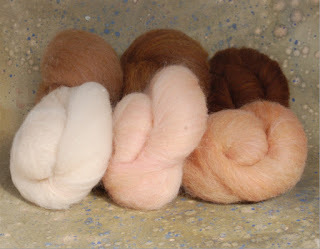 Copper Chunky Core (right middle), and Cinnamon Dyed Core (top). with Gray Chunky Core (left) and Denim Dyed Core (right). with Off White Chunky (left) and Funky Chunky Core (right). with Brown Chunky Core (left) and Black Dyed Core (right). 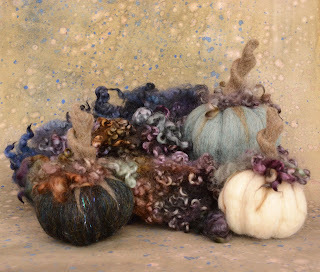 And if you like to coordinate your home decor with the season, consider making pumpkins that can decorate your house through the winter with Snow Hare or Snow White (sparkle) batts. Add any color locks that make you happy! with Off White Chunky Core (back). Please remember too that this is just a starting point. There are so many possibilities if you want to try to make your own color palettes. Notice the magenta pink pumpkin in the photo towards the top of this post? We took our Berries Top Coat Sampler and blended the 4 colors together (you can use hand carders to start (watch video), but if you become addicted to blending your own colors, you may want to invest in a drum carder). 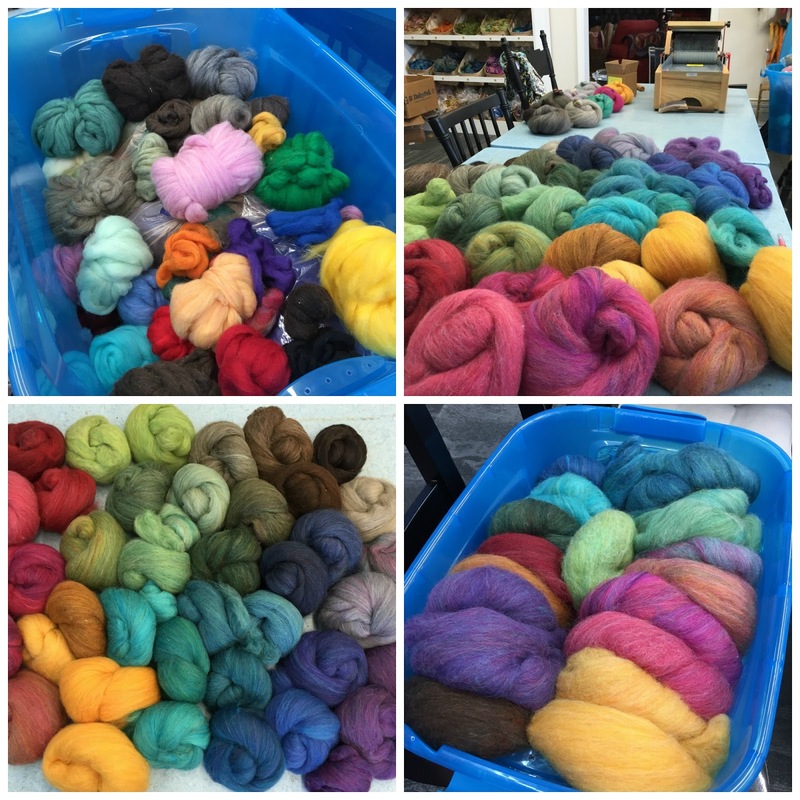 Check out all of our Roving and Top Coats for colors that you can blend or use as is for your pumpkin body and stem colors. Needle Felting Surface and Needle Felting Needles. (Pen and Punch tools are handy). Core Wool for the body. Top Coat or Batt for Pumpkin color. Top Coat or Batt for Stem color. Dyed or Natural Sheep Curls. If you are making faces, have a toothpick and small bamboo skewer on hand. Don't forget to check out the Pumpkin Tutorial Bonus Material video for more pumpkin ideas! Have fun and show us your pumpkins on our Sarafina Felting Fanfare Facebook Group! One of my favorite things about working at Sarafina as a wool washer and dyer is that I get to help find and try all kinds of fleeces from small farms here in the US. 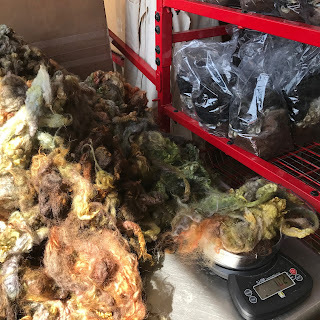 Sometimes we order fleeces with the hopes of the right color, definition, and length for our kits but what we get does not always wash up the way we expect. Often we just see really great fleeces and want to see how they can be used. 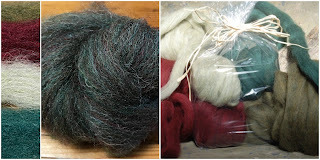 The concept behind the Marsha's Mish Mash bags is to be able to share unique fleeces that we come across that have lots of potential for experimentation. The uniqueness of these fleeces means that these bags are limited edition, and the number that we get is all that we will have. We look forward to having new batches when the previous one sells out. Brown Huacaya Alpaca in various lengths from 1" to 3". 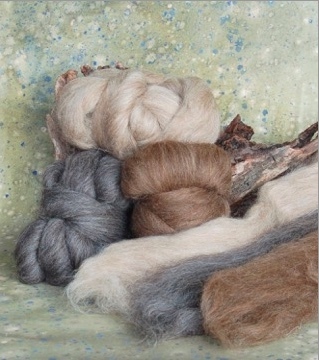 Rose Grey Huacaya Alpaca in various lengths from 1" to 3". Dark and Light Lincoln with some curly and straight bits. 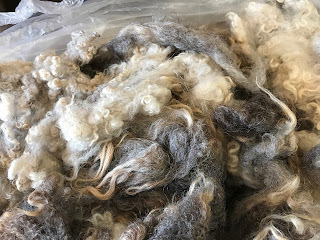 Finn Sheep Fleeces before dyeing. Weighing out the bags showing the dyed Finn Sheep. This particular Finn Sheep had found some burrs while on the farm. We hand picked them out, but may have missed some! 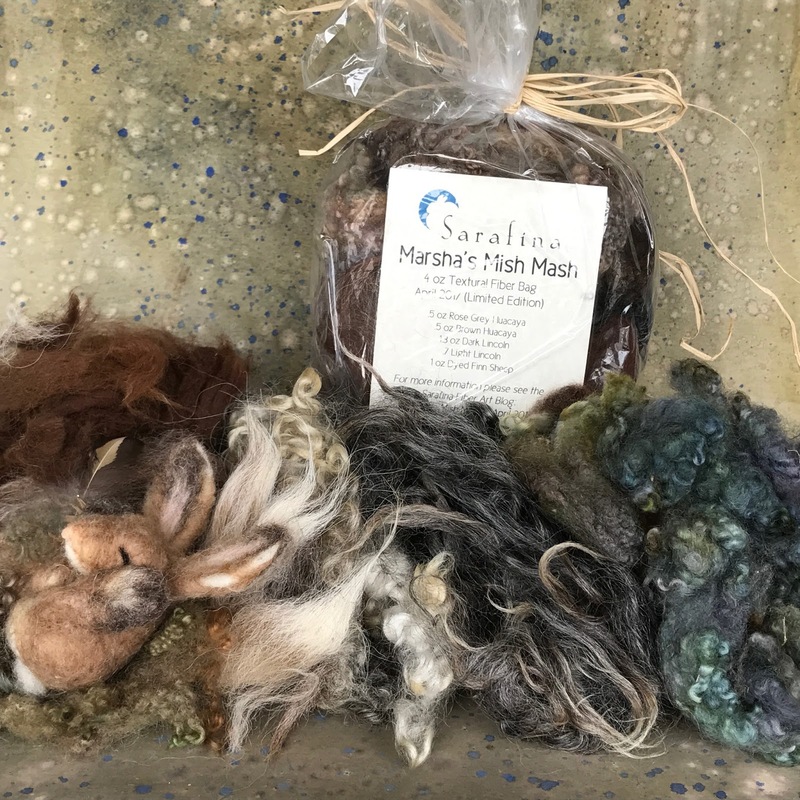 We would love to see what you are doing with these Mish Mash Fibers so if you are on Social Media, use the hashtag: #MishMashFibers to show off your work. Through the Sarafina Fiber Art Website we carry lots of wool for needle felting and we have broken them down into a few categories to make your shopping for supplies easier: Core Wool, Roving and Top Coat, and House Carded. We created this category to assure you that these rovings are the best choice for the beginning of your sculpture and making shapes. 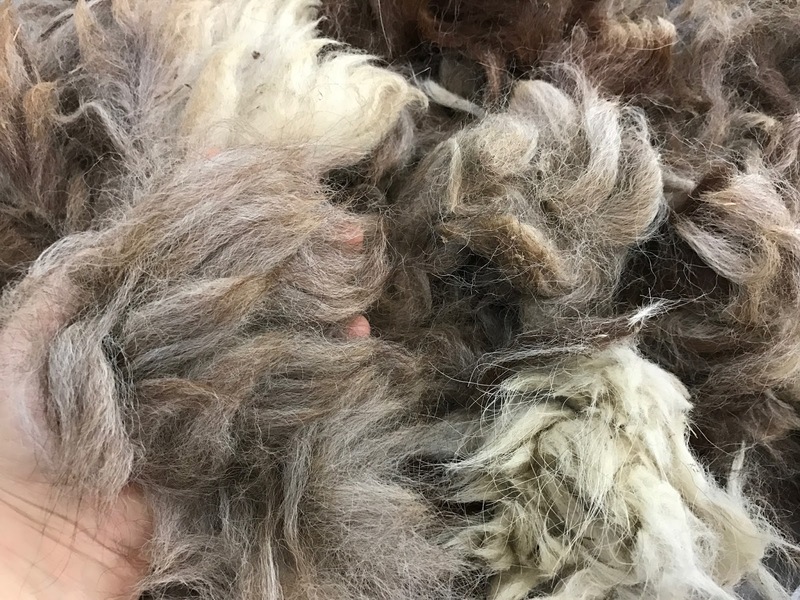 They work well because they are a blend of many different sheep types, creating a fuzzy but consistent, and easily felted texture. Of course you can also use any of these colors on the top of your sculpture, but we wanted to distinguish them from the other rovings as ideal for core. Our Chunky core wool is springy and uniform so it builds up large bulky areas quickly but is also smooth enough for the tiniest details. 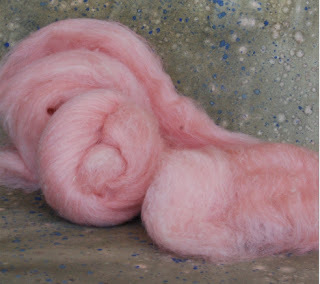 This roving is a blend of various sheep's wools creating the perfect voluminous, easily felting texture for your needle felting projects. Perfect for the core of your project. A wide variety of fibers and textures, and colors which are used in a wide range of applications. 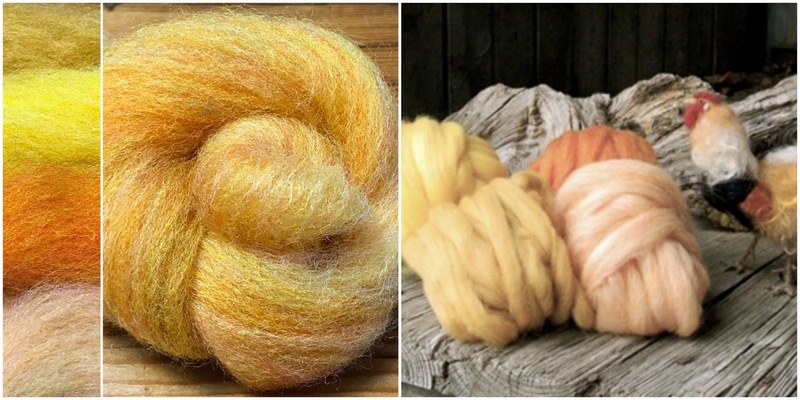 From blends to Romney, to Mohair, we are sure to have a roving that suits your project. 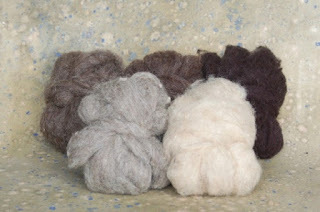 Most of these rovings are best for top coat application in needle felting. 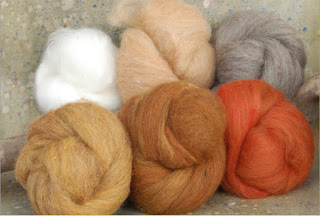 They are also good for wet felting and spinning. For years, Sara has been carding her own custom colors for her sculptures with endless possibilities and satisfying results. We create these 1 oz batts in-house using top shelf fibers like merino, angora, alpaca, and many more. These give you soft and realistic feel with needle fellability in mind. Part of the beauty of an animal's coat is the natural variation in the colors and textures. For that reason, a plain dyed single roving does not have the dimension needed to replicate an animal. Also, the addition of finer fibers to these batts makes a finer top coat for your work. 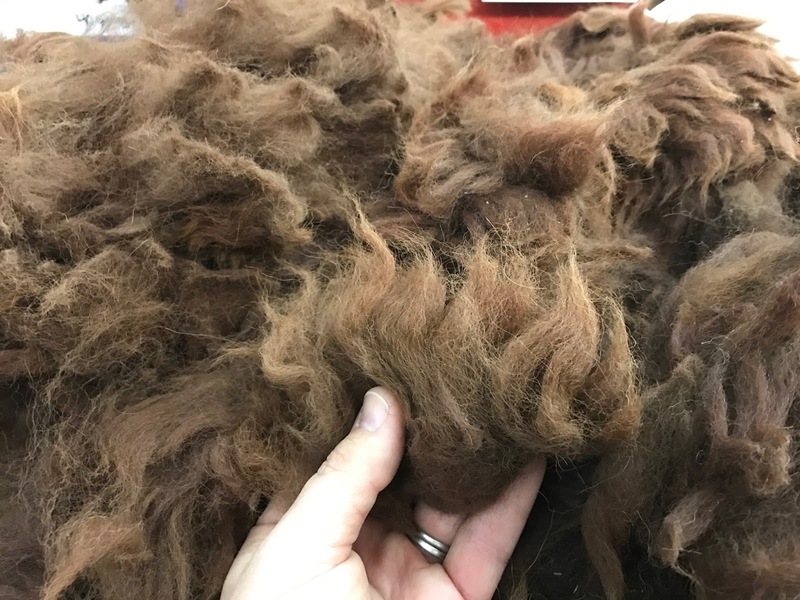 Pelts are meant to be used in a flat/pelt needle felting application. BR: Acorn, Buck, Red Fox. Bunny Bare is a house carded batt made with the pinks of animal's skin in mind. Gnome cheeks, dog bellies, rabbit ears, cats' noses, wherever you need a touch of pink. Snow White is a dreamy blend of white wool for feltability and bulk, and angora for whitening and softness, and iridescent Angelina for sparkle. Sara uses this special blend as a top coat on snowmen, the trim for the Clauses garb, or even a snow layer in a seasonal landscape. Our 1 oz Pig batt is a muted pink blend of top coat, Merino, and a bit of core for feltability. 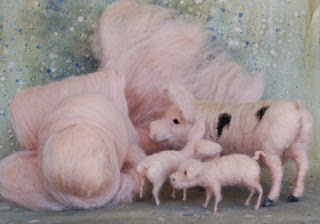 Use as a top coat for your momma pig and her piglets. Skin tones are tough to come by. 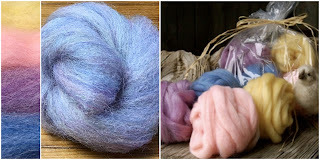 Dyed roving for skin tones is often too flat, too warm, or too cool. Sara has found that by blending these similar tones and values together, she can obtain a more dynamic, alive and realistic color. 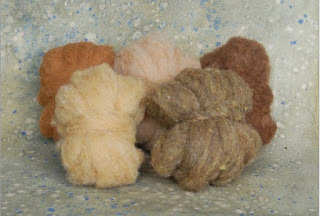 The skin tones batts are a blend of sheep breed wools that work well for needle felting. Each batt is carded several times to make the colors blend seamlessly. We offer the skin tones in 1 ounce batts in six color tones. Or if you would like to try out all six of our skin tones, try our Skin Tones Sampler Pack of 1/3 oz in each of the six colors. Sara found that over the years she was always blending pinks to create a shade for cheeks and lips. She decided to make the Cheeky Batt into a 1/2 oz batt since only small amounts are needed. Bring your Old World Santa to life with our House Carded 1 oz Batts. We designed these rich colors to work well together or alone. They are a well blended variety of smooth top coat wools types that both needle and wet felt well. 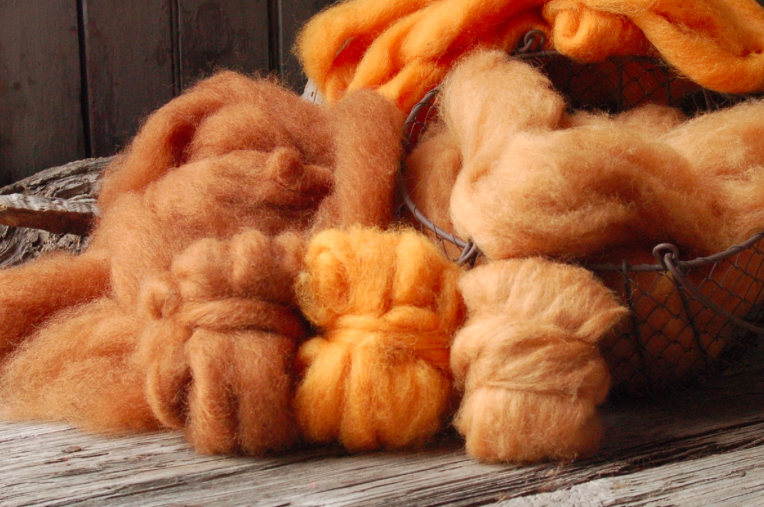 When pumpkin season arrives, celebrate by creating some pumpkins with our rich pumpkin colors. There are three 1 oz batts of the Full Moon, Harvest Moon, and Blue Moon. 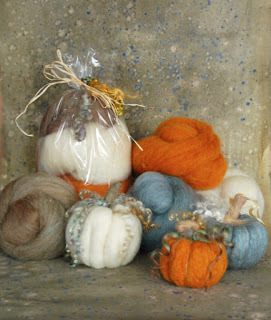 The Vine color is a 1/2 oz batt in tones perfect for your pumpkin stem. Vine, Full Moon, Harvest Moon, Blue Moon. For the spinner, wet felter, 2D artist, or needle felter, our inspired batts will inspire you. We have as much fun making them as you will have using them. With 2D needle felting and wet felting in mind, these batts were created to give you a leg up on some color palettes with fibers that felt well. 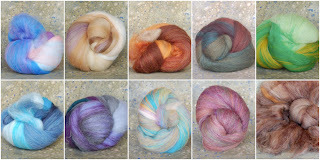 Within this Landscape collection of ten color ways are 7 large 2 oz batts that will have areas where the colors are un-blended so that you can pull from different areas for color variations: Summer Sky, Desert, Canyon, Deep Forest, Meadow, Ocean, and Mountain. 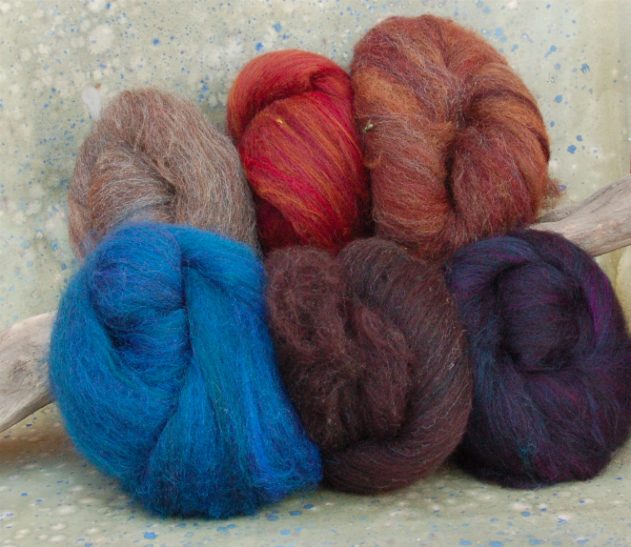 There are also 3 additional landscape 2 oz batt color ways that are blended: Morning Mist, Purple Haze, and Timber. TR: Summer Sky, Desert, Canyon, Deep Forest, Meadow. BR: Ocean, Mountain, Morning Mist, Purple Haze, Timber. 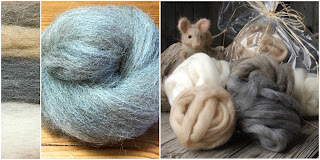 There are plenty of other types and colors of wool on our Sarafina Fiber Art website, so hop over and do some exploring. 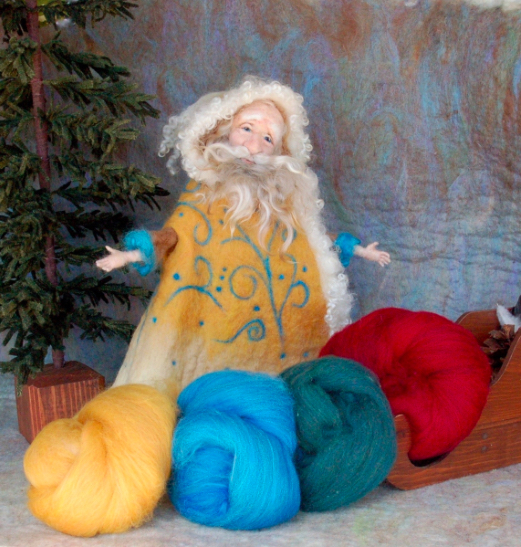 Sign up for the Sarafina Fiber Art Newsletter. If you are shopping through our Sarafina Fiber Art Website, please make sure that you login prior to placing items in your cart so that you can take advantage of our Sarafina Rewards Program.